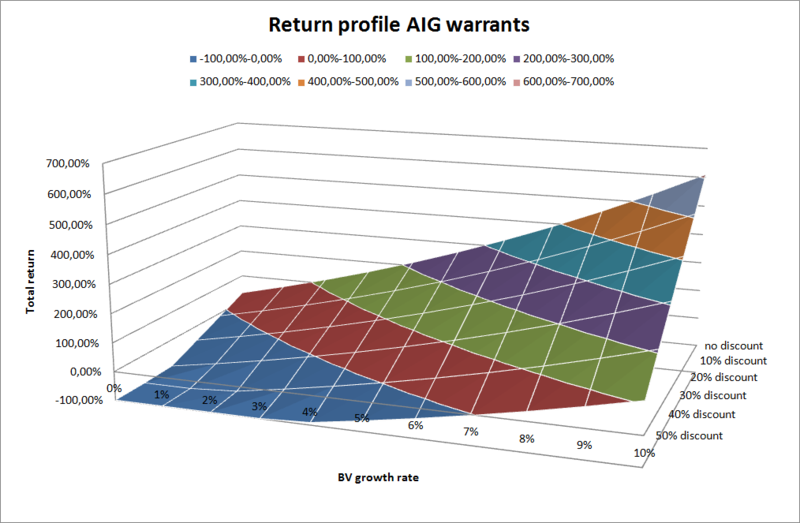 My post on AIG contained some sloppy mathematical errors with respect to the return of the warrants and the common stock (now corrected). To make it up to you I decided to make a nice visualization of how the return profile differs, based on today’s market prices, between the warrants and the stock. Graphed is the total return over nine years at book value growth rates between 0 and 10%, and a book value discount between 50% and 0%. Note that the scale on the y-axis and the color intervals are not identical! Also notice how the warrants only become a better investment if you can count on a shrinking discount to book. The most interesting part of the graphs are the values that are on the diagonal between the bottom left and the top right. Low growth rates will presumable go hand in hand with a big discount to book, while higher growth rates should result in a lower/no discount. Wish I could add the two surfaces together so it would be visible how they exactly intersect, but think that’s unfortunately not possible with Excel, or is it? This entry was posted in Portfolio and tagged AIG on September 14, 2012 by Alpha Vulture. AIG is a company that doesn’t need an introduction and the involvement of the US government since the financial crisis is also well known. The government owned as much as 92% of the company, but is aggressively reducing it’s stake. It already sold three blocks of shares this year worth ~$5.75 billion each and has planned a $18 billion sale for this month. This would bring the stake of the government down from 53 to 21.5%, and underwriters have the option to sell 83.1 million more shares the next 30 days. If exercised it would bring the government stake down to 15.9%. The US Treasury has a cool infographic online that shows the history of the government involvement, and the restructuring at AIG the past few years. I assume that most of my readers are familiar with Joel Greenblatt’s “You Can Be a Stock Market Genius”. Despite the cheesy title it’s an excellent book, so read it if you haven’t already! A common theme in the book is that whenever there is a situation with a forced seller there is a potential opportunity. And while the government is not truly a forced seller, they are definitely happy to get rid of AIG as fast as possible as long as it can report a profit to the tax payer. Selling tens of billions worth of stock without negatively impacting the share price would seems quite an accomplishment. Since June 30 AIG bought 98.36M shares on August 3 for $30.50/share and the company has agreed to buy 153.8M more shares in this months offering for $32.50/share. This would bring the total common shares outstanding to approximately 1.476 billion and AIG’s shareholders’ equity to 96.7 billion for a book value per share of approximately $65.51 dollar. That’s a lot of (book?) value creation a short time frame! While I have had AIG on my watchlist for months I have been hesitant to buy a position because it isn’t easy to fully understand it. The latest 10-K is more than 400 pages long and contains a lot of detailed information about reserves, discount rates, credit exposure and all kinds of other things I don’t really know enough about to understand what kind of impact it has or could have on future profitability. The question is of course how important details are compared with the big picture. Just as with any other company you can look at higher level statistics such as book value, earnings and return on equity. The fact that historically stocks with a low P/B, low P/E or low P/FCF ratio have outperformed the market supports the view that the big picture determines the value for a large part. Bruce Berkowitz’s thesis, who’s firm is betting big on AIG, also doesn’t provide a lot of insight beyond the high-level view. They assume that AIG will be able to earn a 10% return on equity and simply is worth book value because of that. I usually don’t spend a lot of time thinking about relative valuations, but seeing that other US insurers trade close to book currently is reassuring. The 10% is a number that AIG itself is also targeting, and based on the historical earnings (close to $10B annual) of Chartis and SunAmerica, the two core assets of AIG, it doesn’t seem to be an unreasonable target. AIG is facing some headwinds though: low interest rates hurt profitability, and they are also facing increased regulatory oversight. That might not be too bad though if it prevents another 2008 like screw-up. I’m less worried about bad corporate governance with a large cap company than with an obscure micro cap, but I think it’s nevertheless important to take a look at what insiders own and what they are doing. Most of AIG’s management is new since 2009 and as a group they own very little of the company: just ~$25M worth of shares, mostly because they get paid a big part of their salary in shares. If I would correctly be thinking that AIG is undervalued, why wouldn’t insiders buying shares? The initial exercise price is subject to anti-dilution adjustment for certain events, including (i) future stock dividends, distributions, subdivisions or combinations; (ii) the issuance of below market rights, options or warrants entitling the holder to purchase AIG common stock for a period of sixty days or less; (iii) dividends or other distributions of capital stock (other than AIG common stock); rights to acquire capital stock, debt or other assets (subject to certain exclusions); (iv) per share cash dividends in excess of $0.675 in the aggregate in any twelve-month period; and (v) certain above-market issuer tender offers for more than 30 percent of the then-outstanding AIG common stock. If AIG is able to grow book value at a 10% rate the next decade, and is trading at book value at that point in time the warrants could provide some awesome returns. After nine years BV would be ~$153. With the warrants trading at $14.6 and having a $45 strike this would be close to a 640% return or an 23% annualized return. The common stock would return ‘just’ 340% or 15% annualized. But since AIG is probably going to pay a dividend soon the warrants return is going to be a bit lower since the strike price is only adjusted for dividends in excess of $0.675 yearly (would probably lower the annualized return with almost a percentage point). While I do think warrants are attractive it’s not a bet I’m comfortable making because it’s also adding leverage the opposite way. 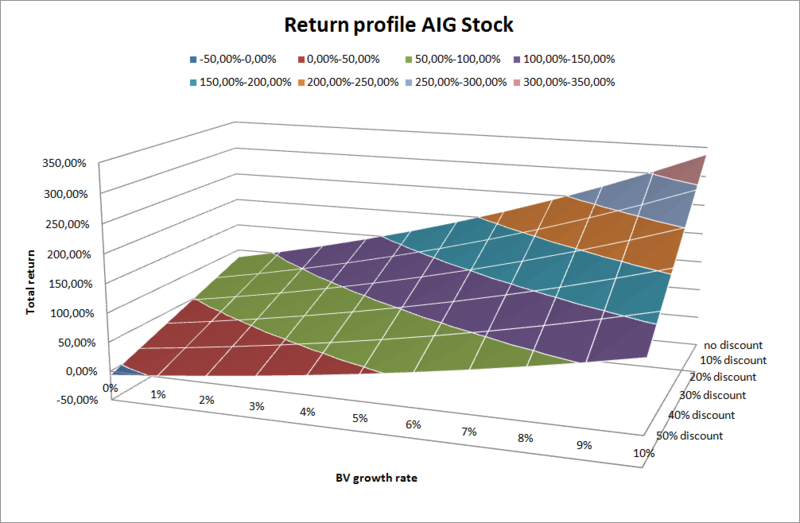 Lets assume that the market is valuing AIG correctly right now – and that’s something I always see as a very real possibility – and the next decade the company is able to grow value at 8% a year. If you hold the shares you still come out ahead with an 8% annualized return, but if you own the warrants you get less than 6%. And somewhere between a 6 and 7% growth rate you start losing money with the warrants. That kind of range of outcomes doesn’t really look that superior to me than the common stock. I have been thinking a long time about buying AIG knowing that I would be buying something that I can only understand from a high level perspective, but finally decided to buy some shares because it seems that the company is undervalued and creating a lot of value by buying back shares in large numbers. Despite this the share price went down this week when the treasury announced another public offering and that AIG would be buying $5B more in shares. So thought that this week would be as good of a time as any to jump on-board.